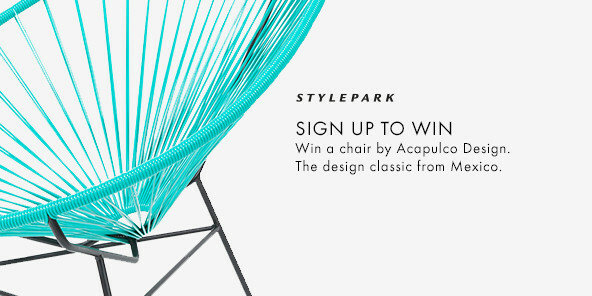 Troldtekt dedicates an online special to the new interest in black interior design. 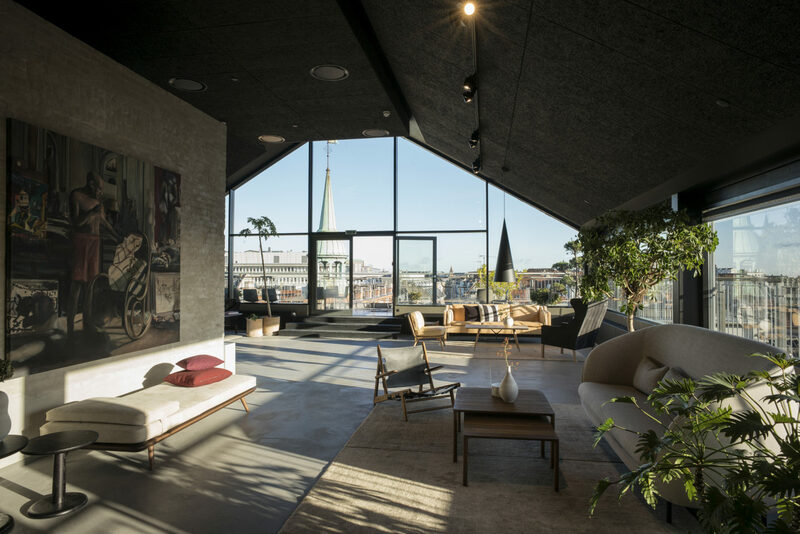 Showroom of the furniture manufacturer Fredericia in Copenhagen by Aarstiderne Arkitekter. The color black is hugely popular in architecture right now,both for exteriors and for interior design. 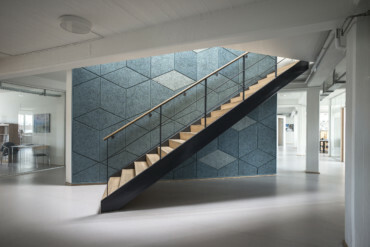 Danish acoustic panel manufacturer Troldtekt is aiming to offer architects and interior designers some inspiration on this topic, and has therefore created “Black is the new black”: a section of its own website dedicated to a whole series of reference projects that make use of Troldekt acoustic systems in dark colors. 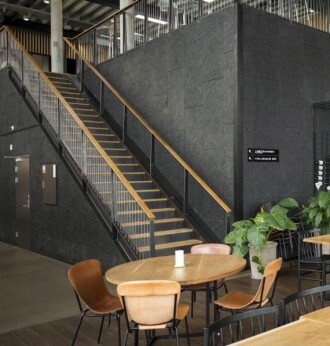 These include, for example, a new showroom for furniture manufacturer Fredericia Furniture in Copenhagen, designed by architects Aarstiderne Arkitekter, for which black acoustic panels have been integrated extensively. Since the showroom has notably sloped ceilings, the dark panels go a long way in creating an impression of space. 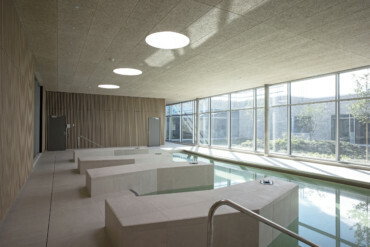 Other projects presented by Troldtekt include the much-praised Design Museum in London, for which Rotterdam-based architects OMA along with London architect and designer John Pawson can take credit. 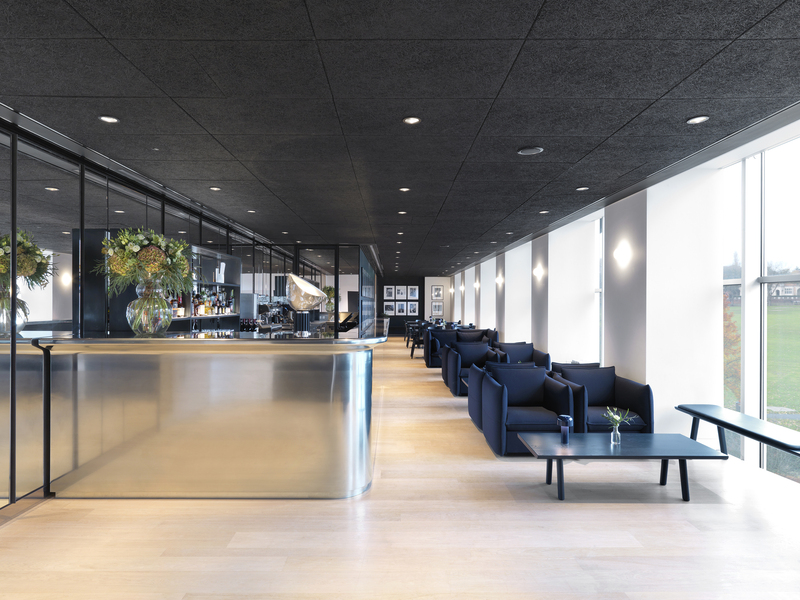 Here, OMA has covered the extensive gastronomy area with a ceiling made of dark acoustic panels, which create a stark contrast with the large windows and the view out onto Holland Park. Meanwhile, at the “Haus elf” daycare center in Kiel, black ceiling panels and anthracite-colored window frames are balanced out by the bright walls and floors. At the same time, they create an acoustic environment that makes it pleasant not only for playful children, but also for adults to spend time there. An in-depth interview with interior designer and trend researcher Rikke Skytte, who advises Danish trend institute “pej gruppen” among others, provides the background to this reawakened interest in dark interiors. She gives a detailed overview of their emergence and development, and outlines the new design possibilities they offer. Webspecial "Black is the new black"
The restaurant area of the Design Museum London, designed by the Rotterdam architect's office OMA. The day care centre "Haus elf" in Kiel. 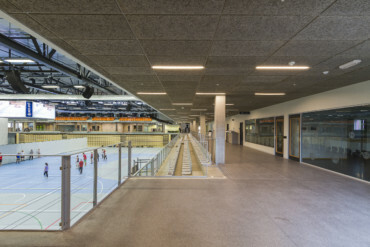 Troldtekt A/S ensures perfect acoustics in multipurpose cultural centers.